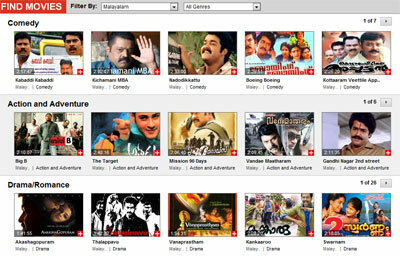 Trivandrum, 25 September 2012: Bigflix.com, India's first online movie on demand portal powered by Reliance Entertainment has launched its Malayalam movie service today. Bigflix will now feature blockbuster movies from Malayalam which can be viewed via computers, tablets or mobile phones. The movies are available at a monthly subscription of Rs. 249. The Malayalam service has been launched with 200 movie titles which includes movies such as Nadodikattu, Kaalapaani, Aaryan, Big B, Vanaprastham, Thalapavu, Gandhi Nagar Second Street, Aakashagopuram, Nivedyam, and lot more.